Make is an extra special Christmas for your loved one with this Half Dozen Gourmet Dipped Swizzled Strawberries this holiday season. The Half Dozen Gourmet Dipped Swizzled Strawberries will make excellent Christmas gifts for friends, family members and coworkers this year. With six magnificent strawberries that are hand-dipped in a variety of delectable chocolates and topped with your loved ones’ favorite Christmas swizzles, these exquisite strawberries look almost too good to eat! 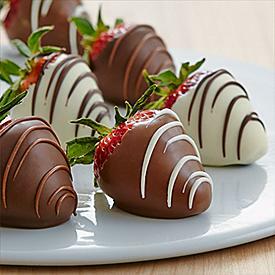 Each order includes 2 scrumptious strawberries that are hand dipped in milk chocolate and decorated with white swizzles, 2 delicious strawberries individually dipped in dark chocolate with milk chocolate swizzles, and 2 delightful strawberries dipped in white chocolate with dark chocolate swizzles. For even more unique Christmas gifts, choose to add your choice of dipped pretzels, cheesecakes, double or even quadruple the strawberries for just a few dollars more. An excellent choice for those hard to buy for individuals on your Christmas list, the Half Dozen Gourmet Dipped Swizzled Strawberries are certain to be a hit this holiday season.